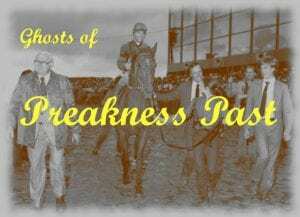 Our 2018 Ghosts of Preakness Past will feature stories of eight editions of the Preakness from the last 40 years. Today, 1978 and the epic showdown between Affirmed and Alydar. On May 20, 1978, the dirt oval of Pimlico Racecourse became the battle grounds of an intense rivalry that would forever go down in racing history. Kentucky Derby winner Affirmed, was set to square off with the runner-up, Alydar, in pursuit of the middle jewel of the Triple Crown. The stage was set for an epic rematch between the two heavyweights of the sport. Affirmed and Alydar headed to post in the Preakness Stakes as familiar foes. In fact, the tenacious duo had already faced each other six times before the “Run for the Roses,” starting in the Youthful Stakes the year before. The budding rivalry continued through the Great American Stakes, Hopeful Stakes, Futurity Stakes, Champagne Stakes, and the Laurel Futurity, with Affirmed winning all but the Great American Stakes and Champagne Stakes. From the very beginning it was clear that Affirmed possessed an uncanny desire to win, and it was that very quality that carried him through one of the most brutal rivalries in all of sports. Only five horses dared to challenge Affirmed and Alydar in the Preakness Stakes. However, the size of the field did not matter because Affirmed, with Cauthen up, and Alydar and Jorge Velasquez ended up turning the event into a two-horse race. When the field barreled around the first turn at “Old Hilltop”, Affirmed decided it was time to strike the front. The little chestnut charged his way to the lead and never looked back, cruising effortlessly through furlong after furlong. While the Derby winner flaunted his speed on the front end, Alydar lurked toward the back of the pack, watching and waiting for his moment to pounce. That moment came when the field reached the final turn, and from there the race was on. Alydar made a bold, sweeping move around the final bend, with Affirmed set fiercely in his sights. The imposing, red beast went after his rival, blasting over the ground. For a moment, it looked as if Alydar would go flying to the lead, but Affirmed had other ideas. Sensing the oncoming challenge of his foe, Affirmed fought on, unwilling to give up the lead. Alydar was relentless in his pursuit of the lead, but Affirmed would not give an inch. The pair sprinted wildly down the stretch, fighting each other tooth and nail for every stride. Alydar’s gallantry was unwavering, yet the Derby winner remained steadfast, somehow managing to remain one step ahead of his foe. Separated from the rest of the horses by nearly eight lengths, Affirmed and Alydar blazed toward the wire in a dramatic stretch duel. Refusing to give in to defeat, Affirmed strained his neck out as far as he could reach and kept it there. In thrilling fashion, Affirmed dashed over the wire in front, fending off his rival just enough to declare victory by a neck. Affirmed. Photo by Double J Photography. Affirmed’s margin of victory over Alydar in the Preakness became even narrower three weeks later in the Belmont Stakes., when he outlasted his rival by a nose. However, it was still enough to see him through. The son of Exclusive Native, a Florida-bred, had brought the Triple Crown to trainer Laz Barrera and owner-breeder Harbor View Farm. 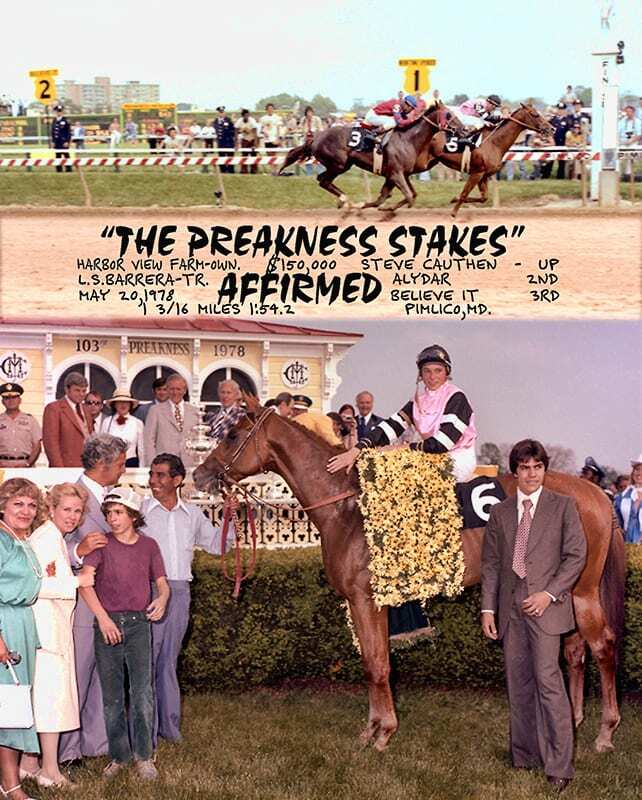 Affirmed thus became only the eleventh horse to sweep the Triple Crown. Affirmed was small in stature but big in heart, and that is why he was able to pull off what he did. The hidden quality that it takes to conquer the most formidable of challenges can only be found from within. That, perhaps more than any other quality, is what set Affirmed apart.